Data shows that 9 out of 10 people breathe air containing high levels of pollutants, resulting in an estimated 7 million deaths worldwide each year. IMCHE3 is proud to host the interactive “BreatheLife” exhibit on urban air quality and health, which has been traveling around the world over the past two years. 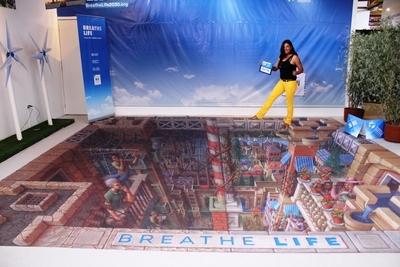 The exhibit includes a 3D street painting from the famous street artist Kurt Wenner, illustrating scenes from clean and polluted cities, as well as a virtual bike tour of cities around the world. The traveling exhibit is part of the BreatheLife campaign, an ambitious campaign by the World Health Organization (WHO), UN Environment and the Climate and Clean Air Coalition (CCAC) to protect our health and climate by improving air quality. It aims to dramatically reduce the 7 million deaths annually from air pollution by 2030 and slow the pace of climate change. The campaign targets cities, regional and national governments, the health sector and citizens, including parents who are concerned about the health of their children, students, and social media users. Within the health sector, specialists of cardiovascular, respiratory diseases and cancer are targeted. Through its network it showcases and promotes solutions for transport, waste management, household air pollution, energy supply, industry, and food and agricultural production that will help tackle pollution and climate change. A number of cities have signed up to the campaign, with Ghana being the first join. In Accra, much work has been done to engage local communities in the conversation around air pollution and the impacts of health. Breathelife uses a variety of tools and materials to raise awareness, including messages printed on T-shirts, dramatic performances, infographics, videos and exhibits. Cities and regions that join the BreatheLife network are encouraged to raise awareness about the health and climate impacts of air pollution, and to put their city on the path to meeting WHO Air Quality Guidelines or Interim Air Quality Guideline Targets by 2030. Nearly 40 cities and regions, as well as some countries, have joined the campaign.